Living standards have risen 20-fold over the past 200 years. Yet they rose just 3-fold over the previous 800 years. What enabled this dramatic change to take place? But why did the Industrial Revolution suddenly develop around 1750? Why had it not occurred earlier, in Ancient Rome or Greece or Egypt, or in China, India or elsewhere? The blue line highlights how GDP/capita remained static before 1700, when Maddison estimates it was around $475. It then suddenly accelerated to $1300 by 1820, $4000 by 1900, $9000 by 1950, and to $30000 by 2010. The last 2 centuries have clearly been an extraordinary period in human existence. 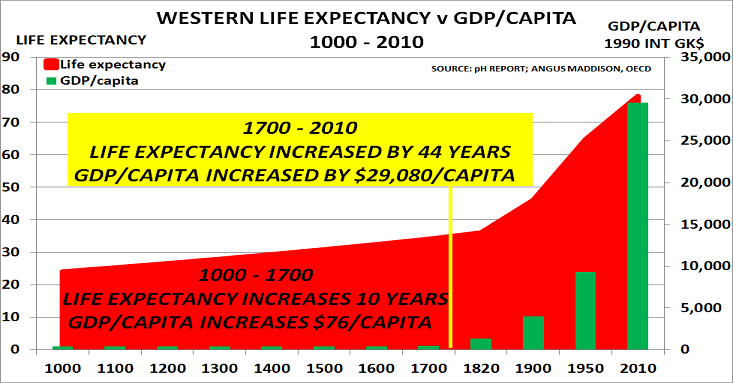 The red line highlights the key enabler of this amazing change – a vast and sudden increase in life expectancy. It had risen only 0.05%/year between 1000 to 1700 – from 24 years to 34 years. But by 1900 it had risen to 46 years, and today it is 80 years. The development of smallpox vaccination, originally imported from Turkey from 1721, changed this disastrous situation. British physician Edward Jenner then developed a safe vaccination in 1798. He has since been credited with having saved more lives than almost anyone else. These are developments which would have been unimaginable in 1700. Along with childhood, another key development as a result of rising life expectancy was the concept of old age. Since Jenner, we have developed many more vaccinations, as well as other important drugs, and learnt about the value of healthy diets and lifestyles. We also have chlorine in our drinking water to protect against cholera and typhoid, heating in our homes to protect us in winter, packaging to protect our food against disease, and many other advances. In turn, these advances led 125 years ago to the introduction by German Chancellor Bismarck of the first-ever first state pension system in 1889 (as we described in chapter 1 of ‘Boom, Gloom and the New Normal’). This later became the model for many other countries, including the USA. German life expectancy was 45 years at the time, and he set pension age at 70 years – it was meant to be a small amount of money, for a small number of people, for a small number of years. “Consumption is 60% of European GDP. And so a growing army of pensioners creates obvious headwinds for growth. They lack the income to stimulate demand themselves, while the spending power of the younger generation is reduced by the need to help pay for their parents’ pensions. “It is wishful thinking to imagine that Europe’s demographic deficit, created by 50 years of declining birth rates and rising life expectancy, can now be resolved by negative interest rates or the electronic printing of banknotes. “Most worrying is that the ECB’s high profile provides a figleaf behind which politicians can hide. It allows them to continue to avoid the necessary debate with voters about the need for an immediate rise in the pension age to a more realistic level. As we now know, the European Central Bank did not “step back”. Instead, it has decided to launch a €60bn/month ($67bn) money printing programme next month. So it is no surprise the Eurozone is now entering deflation and has sharply rising levels of unrepayable debt.